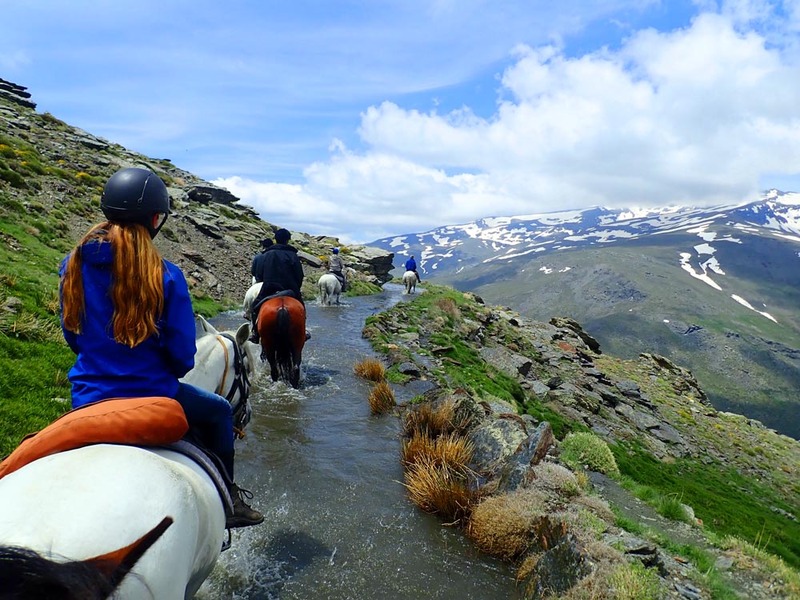 This is a stunning circular trail through the east of the Alpujarras and Sierra Nevada National Park, riding over very diverse and varied terrain, 3 days at high altitude. An amazing display of Mediterranean and Alpine flowers cover the mountains in May and June. The first two days of this spectacular ride pass through the southern slopes of the Alpujarras following the ancient Moorish paths and forestry tracks between the picturesque white villages. The third day we climb to the Peñon del Puerto and maintaining an altitude of over 2,700 metres follow the ridge east to the Puerto del Lobo and the Altos de San Juan. Seemingly endless vista of mountains and plains give an amazing sense of space and wilderness. The fourth day keeping an altitude of between 2,000 and 2,500 metres the trail passes through the summer pastures and woodlands of the northern slopes. Day five the path crosses the high peaks at nearly 3,000 metres to the south side of Sierra Nevada and the Sierra of Trevelez. Day six head home on forestry tracks. A reasonable level of fitness is required as much of this ride is at high altitude (2 days at over 2,700 metres), on three days there are sections where it is necessary to lead your horse down hill on rough uneven ground for up to an hour. One night we are in a high mountain refuge of Postero Also where it is necessary to share rooms. The other nights are all in comfortable hotels or guest houses. Transfer from Malaga airport to the village of Bubion at designated time. While in Bubion you will be staying in the charming Casa la Sevillana. A comfortable 19th Century town house, 7 bedrooms with private shower-rooms, large patio, sitting room, breakfast room. Located in the heart of the village within minutes walk from the local restaurants and cafes. Dinner with the rest of the riders and a briefing on the following days activities. After breakfast you will be driven the 5 kilometres to the stables and introduced to your horse for the week. Today we head east to the village of Trevelez. The ride starts with a leisurely morning allowing you to become acquainted with your horse. Following a combination of tracks and bridle paths through pine and oak woods we cross over into the valley of La Taha passing the villages of Pitres and Portugos. After a picnic lunch in the shade of the pines we join the main forestry track leading to the village of Trevelez. During the afternoon there are opportunities for some good trots and canters. Overnight in the village of Trevelez, renowned for its air cured ham (serrano ham) and at an altitude of 1,476m the highest village in Spain. The final descent into the village is approximately a 15 minute walk on the old bridle path. Overnight and dinner at Hotel La Fragua. Swimming pool. Continuing east we cross the river of Trevelez and follow the centuries old bridle path winding it way along the Moorish irrigation channel. Leaving the oak woods below the path climbs steeply through pine woods to approximately 2,200 metres to join a forestry track leading over into the valley of Berchules. After a picnic lunch in the shade of the woods we continues along the track passing high mountain farms and pastures. The track follows the contour of the valley deep into the mountains, maintaining an altitude of approximately 2,000 metres there are wonderful views of the high Sierras ahead and the valley below. During the afternoon some nice canters. The horses spend the night up in the mountains and the riders are driven down to the village of Berchules. Approximately 45 minutes. Overnight in the very comfortable Hotel Berchules. Swimming pool. A spectacular route taking us up to approximately 2,800 metres, following the ridge forming the very backbone of the east mountains of Sierra Nevada. After breakfast drive back up the mountain to the horses. The first 4 kms of the ride continues on the main forestry track until picking up the path leading cross country high into the mountains; picnic on route. On reaching the summit we leave the path to follow the vast open ridge east to the peak of San Juan. It is difficult to convey in words the grandeur, space and wilderness of these mountains. From San Juan a steep and stony descent on foot of approximately 40 minutes. After which we mount up and ride the final hour down to the edge of the pine woods where the horses spend the night and we are driven to the village of Yegen. Approximately an hour. Today we pass over to the north face of Sierra Nevada and another day of spectacular views and unspoilt nature. The terrain today is very varied as we make our way west crossing numerous steep summer pastures and snow fed mountain streams. Following small and often steep cattle paths we cross deep gullies and ravines, mountain streams and old irrigation channels passing through small summer farms now just used for cattle and sheep. Dropping down to the tree line we follow the path through the shade of the pines to reach the mountain refuge of Postero Alto (1,900metre) where we will spend the night. Picnic on route. Overnight and dinner in refuge, shared rooms, blankets are provided but you need to bring your own sheets or a sleeping bag and towel. The morning starts with a climb of nearly 1,000 metres to cross over the Puerto de Trevelez to the south of Sierra Nevada. Near the summit we often skirt round snow drifts, stopping to rest the horses at the snow fed streams. Once on the south side we follow small cattle and sheep trails maintaining an altitude of approximately 2,500 metres. Spectacular view across the valley to the snow capped peaks of the Mulhacen and Alcazaba. Late morning we ride along an old Moorish irrigation channel for about 30 minutes, often the channel is running and horses and people enjoy the cool splashing water. Early afternoon commence the descent to the tree line where we will picnic. The later part of the afternoon we follow a steep and narrow path down to the river of Trevelez. The descent takes approximately two hours of which at least an hour and a half is on foot. Overnight in Hotel La Fragua. Swimming pool. Approximately 3 to 4 hours. Today is a short ride. Following the forestry track through pine and oak woods we return directly to the stables high above the villages of the Poqueira. This route not only offers wonderful views out over the Contraviesa mountains and the Mediterranean sea, but some good opportunities for canters. Late lunch in the village of Capileira or Bubion. Afternoon free for some last minute shopping and a well deserved siesta. Overnight in the village of Bubion and farewell dinner. 7 nights accommodation with breakfast, lunch and dinner. Guide, backup vehicle for luggage. Transfer to and from Malaga at pre-arranged time. Just back from another perfect week with Dallas and her wonderful horses. This is the second time my mum and I have come to Bubion (first time for the La Alpujarra Ride and this time for El Marquesado) and it couldn’t have been better. schooled horses; delicious food and brilliant hotels; fantastic company and the most spectacular scenery in the world, and what a way to see it! For anyone thinking about a riding holiday, an absolute must! Thank you dallas, Mordecai and Jeanette, and not forgetting your beautiful horses. We will be back! Dallas’s new ride was spectacuar. For me it retraced parts of both of my previous rides with Dallas – The Contravesia and El Marquesado however the 2 new days were wild and at altitude in the Northern Slopes of the Sierra Nevada – nothing but space and no one but us and the bird and wildlife of the area – ibex and eagles seen every day. was comfortable throughout with plentiful, good food and for me the opportunity to swim after a day in the saddle was bliss! Dallas’s lunches continue to be legendary! We were all return riders so thank you again to Dallas, Mordecai and Jeanette for yet another wonderful week of great riding, great company and always a lot of laughter – my plan is to return again in the Spring. Hi Dallas, I guess by now you will be back from your second Marquesdao ride – my goodness I do admire your stamina! I notice on the weather forecast this evening that southern Spain is getting some rain (which we are having in abundance here), so I do hope that includes the Sierra Nevada. I haven’t been touch until now because I think it’s good to let the dust settle a bit before thinking about trips away and how they really went. it was a wonderful adventure, a huge thank you to you and Mordacai for your efforts to give us all a memorable and spectacular trip on wonderful horses – and you did – in spades! I’ve been telling people it was more of an adventure than a holiday – we were happily exhausted when we returned (not helped by Sleazyjet’s broken plane which led to a five hour delay at Malaga. Amazing really, as SJ said, good to know people like her are in charge of our national businesses!). And we wished we had a couple of days to collapse afterwards at some nice local hotel. But oh my goodness, I will not forget my friend Jeleo (how to spell?) who looked after me so well and was such fun to ride too. the epic scenery, the spring flowers, the mountain streams, pine groves, cattle and their calves – with bells on – and the great company. Us pathetic Brits aren’t used to that heat but that was all part of the Spanish experience – as was the Paella which you kindly arranged for me. I just wanted to say a very big thank you for giving me the most special week. I can honestly say that you gave us all a truly memorable experience of wonderful horses in the most stunning countryside. All the routes and tracks you led us were beyond my expectations and your choice of hotels and menus were all spot on. How you managed to effortlessly produce lunch for us all out of nowhere was quite beyond my comprehension. The scenery was spectacular particularly at the highest points in the mountains, and we saw some wonderful sights such as that group of vultures taking off when we rounded a corner. You and Julio obviously have a very wide knowledge of the areas we were passing through which showed during the week, as was your attention to detail and regard to safety.